It’s not unusual to pair music with spoken word performance, but in my experience it’s been fairly rare in the ambient music genre. 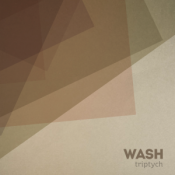 Not being a huge fan of performance poetry, I headed into Tryptich, the release from the sound collaborative called WASH, with a bit of hesitation. Unwarranted. This isn’t bombastic, shout-at-the-mic poetry backed with music. Rather, these three tracks are long walks taken through evolving landscapes with a tour guide prone to flights of interesting language. While I won’t go so far as to critique the poetry itself, poet Scott Bywater’s voice packs a sort of bemused world-weariness as he looks around him, and the rhythm of his words plays nicely into the music around it. Each piece contains a number of short poems (included in a PDF booklet with your download). In places, Bywater repeats phrases over and over, self-looping to intensify a verbal moment. As a writer, I respect a lot of his wordplay. He knows his stuff. The music varies appropriately by piece. On “Phnom Penh/Earth,” there is a blend of field recordings, from nature sounds to the chatter of a living city, deep electronic textures and fittingly sluggish jazz guitar. Warren Daly, Alex Leonard, and Hal Fx craft the soundscape to nicely capture the feel of “the sublime heat of Cambodia’s capital city.” The dynamics shift and flow with the words, showing how the musicians and poet, as the press materials note, “[interact] piece by piece to weave ideas in and out and around, maintaining high degree of improvisation and flexibility within a disciplined structure…” As we shift to “The Art of Travel/Fire Through the Air,” the tone changes to an industrial chug and huff, mechanical and urgent but played against drifting washes as we “drift across Europe.” This piece gear-changes into a sequencer-driven pulse, adding a nice retro feel and keeping the rhythmic sense of perhaps seeing Europe by rail. A ways in, there’s a great passage built on ripping good guitar lines. It’s brief, but the energy of it does a great job of stirring the pot.”The Art of Living/Water” grabs a shimmering guitar line to establish its thematic face, rippling echoes like the flash of sunlight on a pond. Light percussion slides in to lend an understated post-rock feel. Each piece on Triptych is a long, immersive experience unto itself, clocking in at 26, 32, and 29 minutes respectively, and each is time well spent. The blend of music and words is seamless. Neither interrupts the other; the symbiosis shows perfect harmony. Triptych took a small amount of getting used to, but only because it’s such a rare kind of thing to come across my threshold. (And no, I’m not looking to delve more deeply into spoken word, but thank you.) Having delved into it over and over, its beauty–both lyrical and musical–grew on me and the release revealed itself as a thor0ughly engaging, extremely intelligent suite of pieces that exude confidence and truly pull the listener in. You need to give this a try.